Davey manufacture a wide range of pumps for pond and aquacultureuse. Whether you just want to set up a small garden pond or a full-scale commercial water feature, a small hatchery or an entire aquaculture farm, the quality and reliability of the pump and filtration system are critical to your success. The Davey range of pond and aquaculture pumps offer the choice of submersible or surface mount models as well as a full range of filters to help keep the water clean. Crystal clear water is the aspiration of every pool owner. Davey strive to provide the best possible filtration equipment, with a selection of filter types and sizes to suit most pool shapes. All Davey products are designed and manufactured to the highest standards from quality tested and corrosion resistant materials to ensure long, trouble free operating life. Ponds and water features can be one of the most enjoyable features of your garden, home, business or public space. Why stress over the dependability of the driver for this enjoyment – your pump? The Davey Pond Pump is specially designed to suit a vast variety of ponds, fountains and water features. At Davey, we’re committed to ensuring you get the very best from your pool or spa with a range of pumps that means sparkling clean water with a minimum of fuss. The Davey pump you choose will circulate water throughout the system enabling optimum filtration, heating (where needed), and the even distribution of pool chemicals. Davey pool pumps feature highly efficient hydraulic design ensuring that the pump is economical to run and has very low noise levels. The pool pump range features silicon carbide seals and stainless steel components for long life in the most demanding environments. 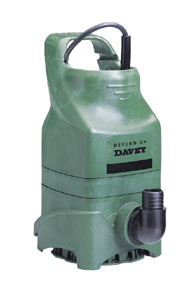 Davey Sump Pumps are tough suckers, with robust designs for long service lives. Right from the smallest model through to the largest, these high-quality sump pumps are designed to give years of dependable service. With a choice of models, tasks ranging from the simple removal of clean nuisance water right through to the super-tough job of grinding and pumping of raw sewage are all comfortably within the capabilities of these pumps. More information regarding Davey pumps can be found by clicking here.